Not too long ago the Leon brand celebrated it’s 10th birthday. Happy Birthday delicious Leon! To celebrate they were giving away free food… Sigh. If only they shipped to Australia. It made me drool to read their giveaways but it also made me pull out my Leon cookbooks and have a nice stroll through the wonderful recipes on offer. 1. Slice the chicken into strips. 2. Melt the butter in a heavy frying pan. Add the chicken and nigella seeds and cook for between 8-10 minutes, or until the chicken is cooked through. 3. Stir in the tikka paste, coconut milk and peas. Bring gently to the boil, stirring all the time, and simmer for a minute or two. 4. Season to taste, add the coriander if you have it. Serve and enjoy with some yummy rice! Affordability : MODERATE. Chicken breasts aren’t that cheap but it makes enough for leftovers. Time Factor : EXCELLENT. Full prep and cooking in under 30 minutes! Complexity : LOW. Very easy, would be one big kids could make or tired frazzled mummies. Deliciousness : MODERATE. Tasty warming curry. Perfect for a cold wintery night. Mess : LOW. Curry pot and rice pot. Save yourself dealing with a raw chicken chopping board and buy the presliced chicken. Tummy Filling Factor : EXCELLENT. Protein, carbs and some veg on the side. Possum Friendly? YES. She ate all of it!!!!!! A rarity at the moment. Turns out she really enjoys green peas. Would I make it again? Yes, probably after a busy day. 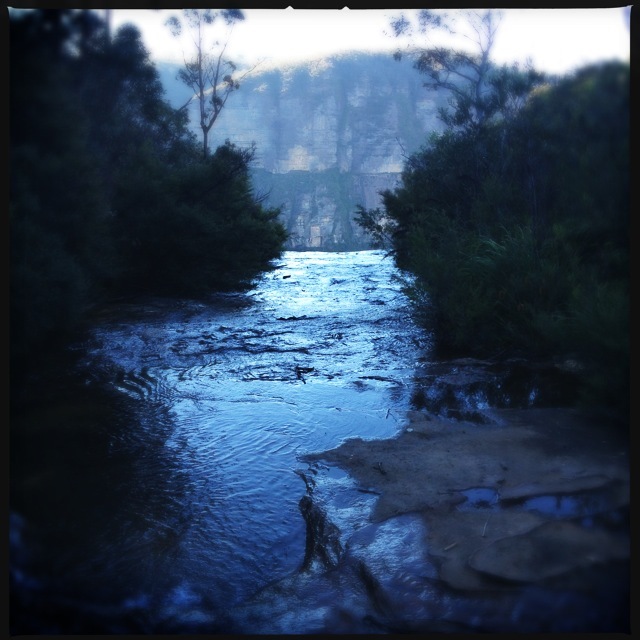 Winter has well and truly settled into our beautiful Blue Mountains. The mornings are crisp and frosty. My drive to work has to be one of the most beautiful in the world! I meander down Mt Vic pass with amazing cliff lines pushing up from a blanket of mist. The days are bright and sunny, perfect for getting out and about, with the air leaving cheeks rosy and noses runny. It’s also the kind of weather to really get into comfort food! Every magazine cover seems to boast “Winter Warmers! Slow Cooked Wonders!”. I know they make me stop and have a flick through. One absolute dinner win has been a Vietnamese Chicken Curry done in my nifty slow cooker using chicken drumsticks (scored for $2.08 in the Quick Sale section at Woolies! Booya!). The recipe is from the I Quit Sugar For Life cookbook (a great book with heaps of yummy recipes even if you keep eating sugar!). For a slow cooker recipe it took me a while to make. I mean days. First the chicken had to defrost out of the freezer. That took two days. Then I made the marinade and let the chook sit overnight. Then a slow afternoon of cooking. But boy was the flavour worth it! Absolutely my favourite slow cooker recipe so far! It’s the lemongrass in it that’s the real winner so don’t try to cut corners and leave it out. Served over a bed of yummy rice, it’s a belly warming winter wonder. Affordability : Moderate. Once you buy your meat, curry paste, coconut milk and lemongrass the cost starts to climb but you do get heaps of leftovers. Look out for chicken on quick sale and keep in the freezer until it’s needed. Drumsticks or lovely legs are both ideal for this! Time Factor : MODERATE. Took a little while to make the marinade, plus I let it marinate overnight though you could marinate in the morning and get it all cooking at lunch time ready for 5pm dinner. Complexity : LOW. As long as you can mix things together in a slow cooker you’ll be fine. Deliciousness : EXCELLENT. Yummy yum yum yum. Mmmmmmmmmmmm mmm. Mess : MODERATE. A bowl to marinate the chicken, plus a chopping board and your slow cooker. Oh and a rice pot. Tummy Filling Factor : EXCELLENT. 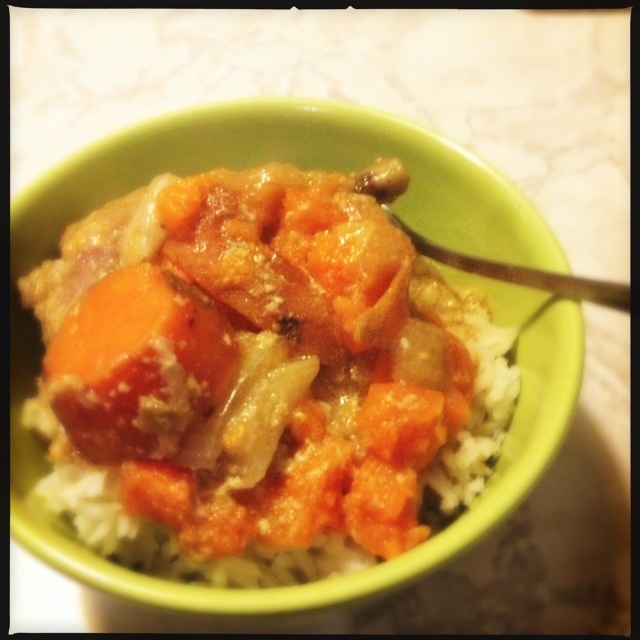 Sweet potato, carrot, meat and rice make me a happy and full. Possum Friendly? YES. Possum loves eating meat off the bone, especially chicken. So this was a clear winner for her! She wasn’t crash hot on the vegetables though, but i served her a side of her favourite thing… mushrooms. Would I make it again? Yup! You betcha! I challenge you to think of a food that isn’t yummy when teamed with pastry… Anchovies? A tart! Strawberry yoghurt? Pastry dip sticks! Steak? Beef wellington! The list goes on and on! If you do think of something, leave a comment, enlighten me! So it’s the end of a week, when there is food to be used up before the weekly shop and cooking cycle begins again. 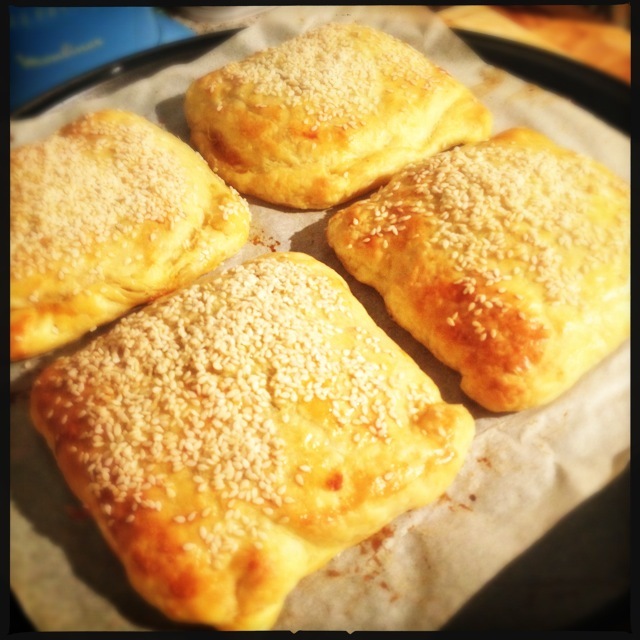 What better way to use up that food than to surround it in golden buttery puff pastry. The main items that needed eating this week were vegetables, I had been a bit over zealous at the fruit and veg shop last week! 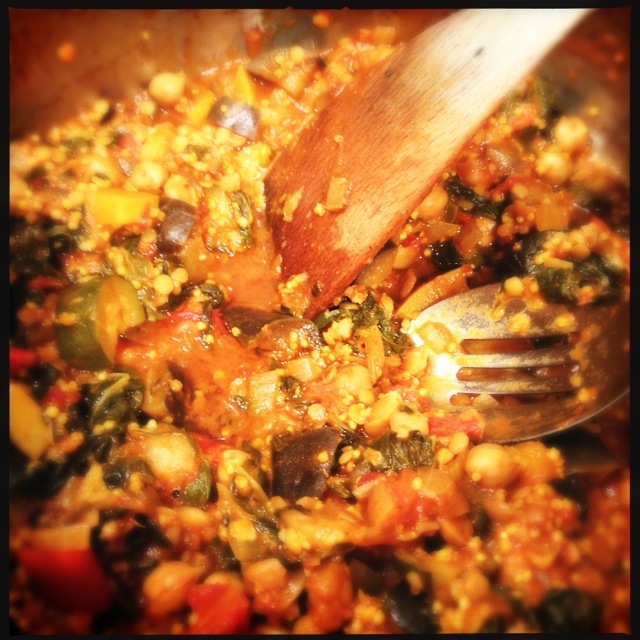 Tonight, I made Space Curry but with extra eggplant, no cauliflower and with zucchini, butternut pumpkin and silverbeet. 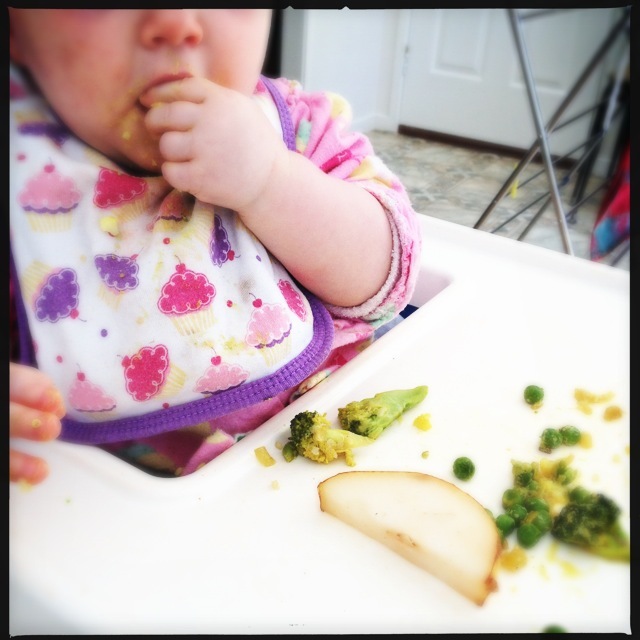 Possum still loved it just as much as she did the first time and ate a heck of a lot of eggplant at dinner. For a bit of added fullness, I added 1/3 cup red lentils, 1/3 cup millet and 1/2 cup extra water and let it simmer away while Possum and I had 5pm dinner. Just as I tend to over fill my tortillas, I also tend to over fill my pastry. I thought the pies were going to be melted blobs of goo coming out of the oven, but miraculously held together! There was enough filling to make two large parcels and 4 small ones with curry leftover for lunch tomorrow. Just a reminder, take off the plastic backing from the pastry BEFORE piling on your filling… lesson learnt the hard way. Affordability : EXCELLENT. Cheap vegetables, canned chickpeas and some store bought curry paste and chutney, the added lentils and millet help to fill it out even further. The puff pastry adds about $5 (I buy the stuff made with butter as I don’t believe in margarine). Time Factor : MODERATE. Quick to get the curry started, but allow 30-60 minutes cooking time depending how cooked you like it all to be. Allow 10 minutes prep to get pies made up and another 20 minutes in the oven. Despite the curry being cooked and ready, tonight’s dinner was a bit late. Complexity : LOW. A nice simple curry to make. If making pies doesn’t tickle your fancy, then you could just make rice! (Even cheaper still!). Deliciousness : MODERATE. Tasty but I prefered the Space Curry as, Space Curry. But it did work well surrounded by golden puffiness. Mess : MODERATE. One pot for the curry, but a couple of trays and some egg mess with the pies. Tummy Filling Factor : MODERATE. Curry as curry would’ve been more filling, but the extra protein in there helped. Possum Friendly? YES. Possum loves curry, and Space Curry especially it seems. Her patience was tested waiting for her serve to cool down enough. Would I make it again? Yes, Space Curry is now planted in the go to list. 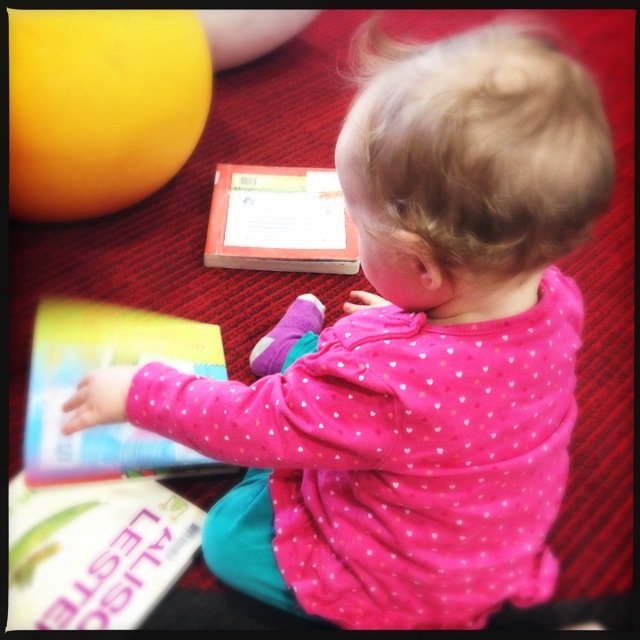 In Possum news, she had her first trip to the library today where she could get out of the Ergo and crawl around. She was more excited by two big kids there than the books (which is surprising as she loves her books!). She is starting to point and has learnt the concept of putting things in, which is a great achievement after months of pulling stuff out. Possum has also figured out a little game. She hides a piece of her dinner under the tray and smiles very cheekily at you and when you say “where did it go?” she pulls it back out and starts giggling. A very cute game, though she played it at lunch with spaghetti bolognese… a messy amount of fun. But worth it to see her be so creative. Mmmmmmm toasted cashews. I love me some nutty curry. Apologies for the lame joke, this 2 weeks at home with a snotty 10 month old for company means my conversational skills are plummeting. We did manage to get out of the house to take my bestie some coffee and cake for her birthday! Happy Birthday Sweetpea! Tonight’s Cashew Curry was so simple and tasty. A no brainer, thankfully! And a Possum success! 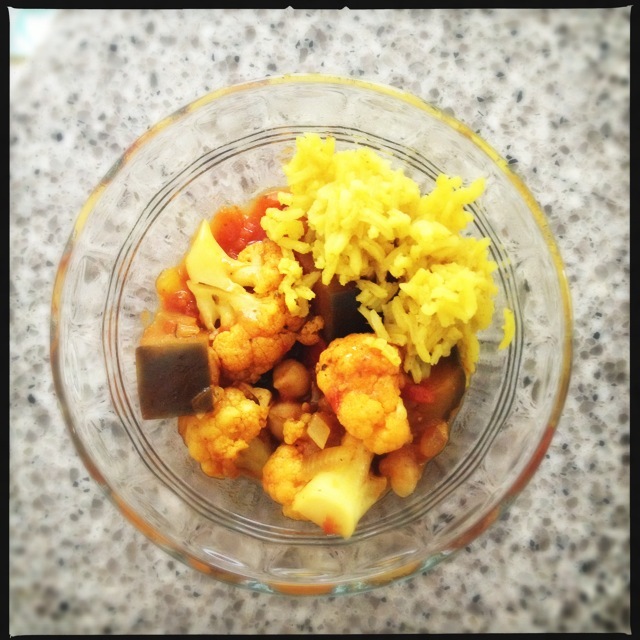 The recipe only has cauliflower, beans and tofu as the curry fillers so I added red capsicum, zucchini and carrot. Possum ate two pieces of tofu and plenty of veg (except for the cauliflower and beans). Legoman liked this straight away, and thought it was one of the Spice Tailor packets. I take that as a compliment as they are super tasty. The crazy thing is, I used Keen’s Curry Powder. That wonderful flavour mix that is normally reserved for curry egg sandwiches (one of my favourites, on fresh white bread with crispy lettuce). No fancy curry powders or mixing or grinding needed. I would highly recommend this as a family meal. Affordability : EXCELLENT. Expensive items were a handful of cashew and some organic tofu. But still works out cheaper than eating meat. Time Factor : EXCELLENT.One pot wonder. Quick prep. Then let it simmer in the pot until veg is cooked to your liking. I cooked it a bit longer than the recipe suggests to get the veg nice and soft for Possum. Complexity : LOW. Super easy. Use whatever veg you have available or is cheap. Deliciousness : MODERATE. A lovely mild curry that everyone will enjoy. 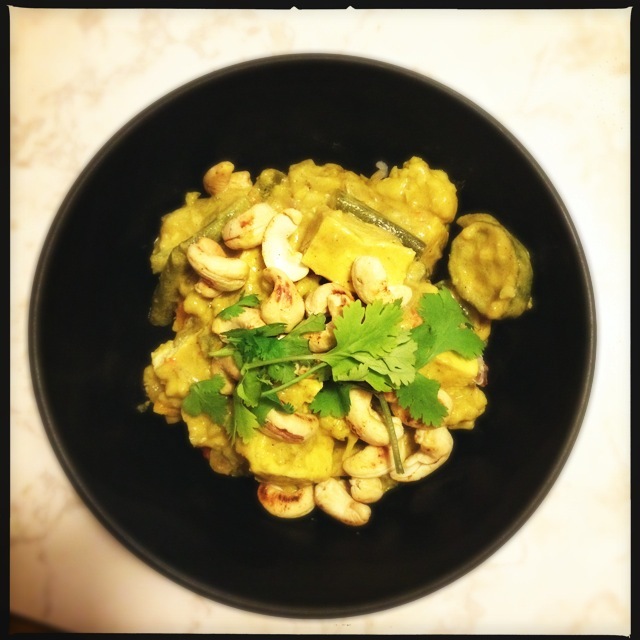 The cashews give the curry some lovely buttery sweetness. Mess : LOW.One curry pot, one rice pot and a chopping board. Hurray! Tummy Filling Factor : EXCELLENT. I was nice and full after a bowl but was hungry again an hour later, but a little piece of my fudgy choc-orange slice filled the gap well. Possum Friendly? YES. Not too spicy for bubs, loaded with good fats from the coconut milk. Just don’t give whole nuts until a few years old. Possum enjoyed the variety of veg in tonight’s meal, you can tailor to suit your family’s likes and dislikes. Would I make it again? Yes. A great midweek simple meal. If you were having meat and time was tight, you could pick up a BBQ chook and chuck that in (obviously not whole, that would just be ridiculous. I kind of wish someone would do that now). ***BONUS QUESTION! Did you miss the meat?Nope. Legoman did though. Personally, I quite like tofu in meals. It tends to just soak up sauces and flavours nicely without over powering. Seems that Possum quite likes it too. And a little touch of cuteness…. 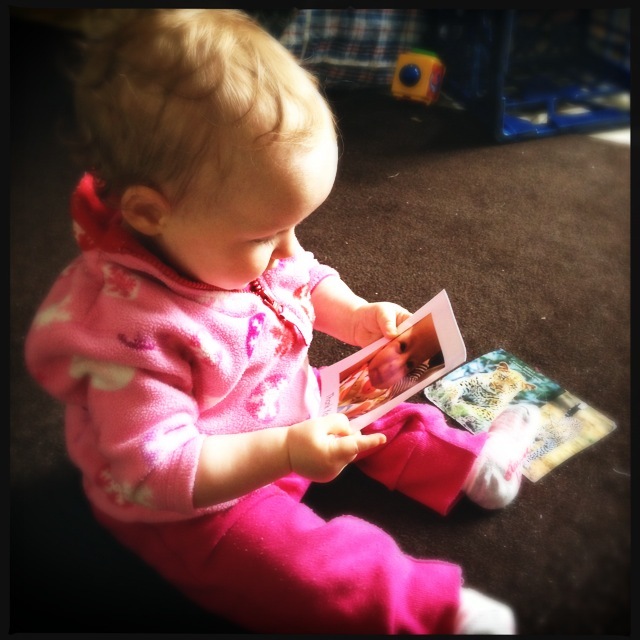 Here is Possum gazing lovingly at a photo of her playdate pal from yesterday. Awwwwww. We are certainly off to a good start this week! Tonight’s Space Curry is a real winner! I knew we were onto something good when Possum wanted seconds, and thirds. Legoman said “I don’t even care there’s no meat!” and “I’d pay money for this!” as well as “I’d serve this to guests, especially *insert vegetarian friend’s name*!”. The way to a woman’s heart? Multiple compliments on her cooking. I sat there, my shirt covered in Possum’s snot, my hair half pulled out (thanks Possum), my teeth not brushed, I can’t remember if I showered today. But I was smiling. The snot fest that is my daughter continues. And with it comes horrendous cabin fever. I had had enough today and so we ventured out to soak up the wonderful sunshine and for me to soak up some human contact (even if it is just with the lady that makes my coffee). Made the world of difference and Possum slept on my back on the way home. Added bonus was running into two mummy friends, a lovely benefit of living in a village. I will apologise for the lack of food piccies tonight. Just as I had served dinner and was about to take the photo, my phone battery died. And I wasn’t going to wait for it to charge enough to take a piccie before eating. But picture this… A bowl of golden rice gently spiced with cardamom, coriander, cumin and turmeric. The rice cradling a rich curry with warm autumnal colours of garnet, terracotta and deep aubergine. A burst of freshness on top with a few leaves of fresh coriander. Contrasted with a tangy dollop of fresh yoghurt. Or I could show you a picture of Possum’s dinner (whoops!). Affordability : EXCELLENT. Cheap vegetables, canned chickpeas and some store bought curry paste and chutney. Made up a large batch and will absolutely be making this again and making use of the curry paste (I used Tikka Masala) and mango chutney. Time Factor : MODERATE. Chopping and prep was pretty quick today (hurray!). I chose to cook this a bit longer than it said to in the recipe (I like curries the longer they’ve cooked for generally). Complexity : LOW. A nice simple curry to make. I realised though that the recipe asks for spices and lemon rind but then doesn’t say what to do with them. So I googled the original recipe and found the answer. It goes in the rice! Here is the original recipe for your reference. Deliciousness : EXCELLENT. This is a winner, a keeper, a recipe to share. Legoman was super impressed. He normally makes his views against chickpeas well known whenever I make something with them in it. Tonight, not a peep. Mess : MINIMAL. One pot wonder and a rice pot. Tummy Filling Factor : EXCELLENT. I guarantee you will either go back for seconds despite bursting at the seams or be sensible but happily satiated. Possum Friendly? YES. She loved it! Especially the eggplant and the chickpeas, which surprised me. She also had a bit of yoghurt with her curry too (an essential addition I think). Would I make it again? Yes, will have to invite some vegetarians over to show off this winner of a recipe. ***BONUS QUESTION! Did you miss the meat? Not at all. To make up for the lack of food piccies today, here is possum attempting her escape… to get the magpie in the garden. 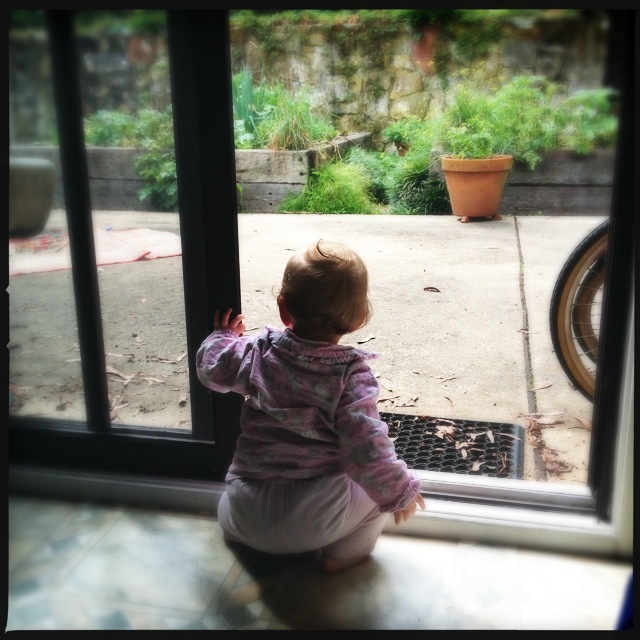 She worked out she can slide the screen door open (not that hard really, might need to lock it soon…). Meal Plan 22/3 – 28/3 a Meat Free Week Special!! This week I am attempting a meat free week for my little family, to raise awareness to how much we over consume meat and how easy and delicious it can be to cut down (or out). When I told Legoman what I was doing with our meals this week his first reaction was “I think I’m working late all week….”. Doubt he will be saying that after he sees what we are actually eating. Check out this for a delicious menu!! I’m hungry already! Tomorrow is my first alone shopping day in a couple of weeks and boy am I looking forward to it! Who would’ve thought grocery shopping could bring so much joy. I might even go and have a coffee. On. My. Own. Today our wonderful little Possum turned 10 months. Double digits already! They always said it would go faster than a blink of an eye, I never really could comprehend it, but wow. It has gone so fast. Today we celebrate by staying at home, quarantined with snotty noses, hanging out in our flannelette pyjamas. I felt like a mum today, “Come here so I can wipe your nose”. Yup, definitely a mum. So we needed food to help make us better. Spices, vegetables and garlic were in order! 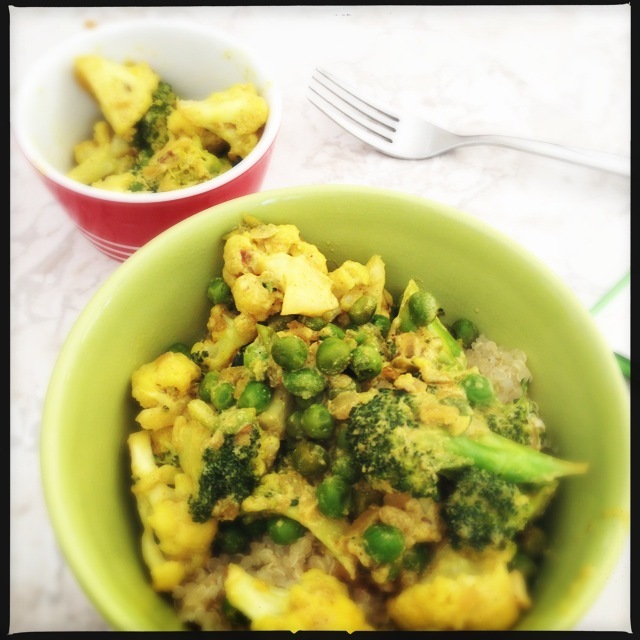 Lunch was this lovely Broccoli Cauliflower and Pea curry, which was tried and tested before. A possum favourite. It makes me a happy mumma when Possum gobbled up all the broccoli first. Dinner tonight was a favourite of mine, Leon’s Not Too Spicy Chicken CousCous. I have spoken before about how wonderful the Leon chain is and their super fantastico cookbooks. This recipe is from the first book (the best of the bunch). 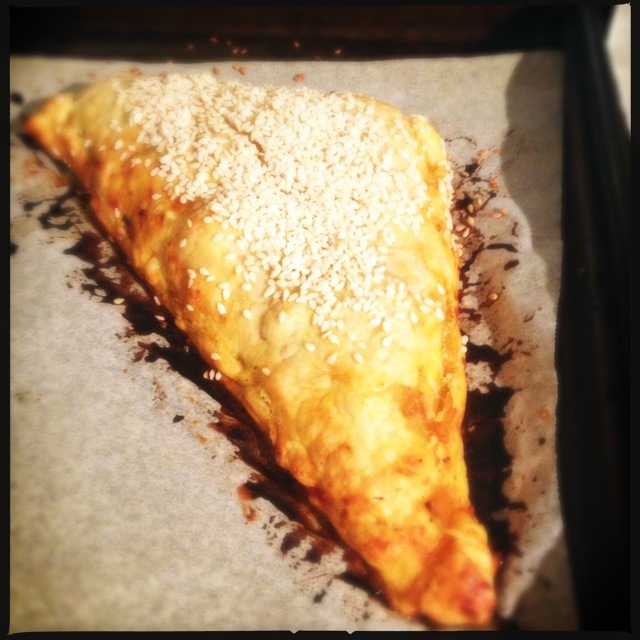 It is one I make often when friends are coming over as it’s tasty and simple. This was a good way to use up some of the chicken stock in the fridge that I made last week. I managed to find another blogger today who gushed over Leon with the same amount of love I feel for them… here is her post. It includes the recipe for the couscous. I do a few little tweaks. Instead of raisins or sultanas, I used chopped dates. I also like to add some vegetables in with the couscous. 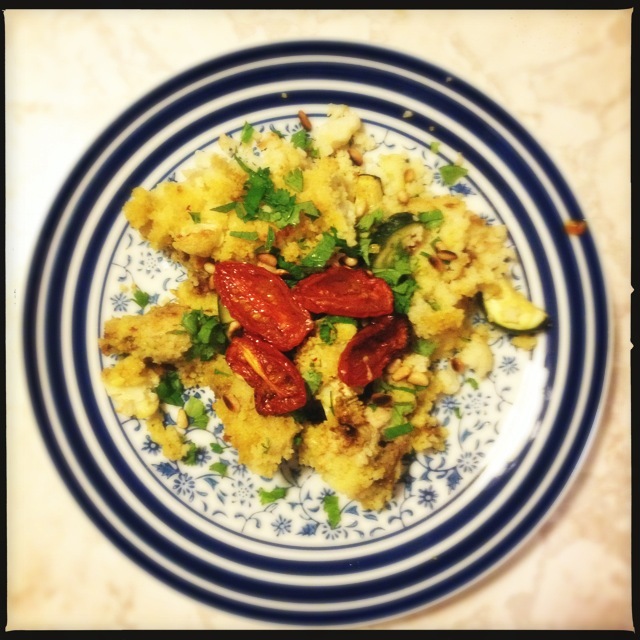 Tonight it was cauliflower and zucchini (chopped kale is another good one). 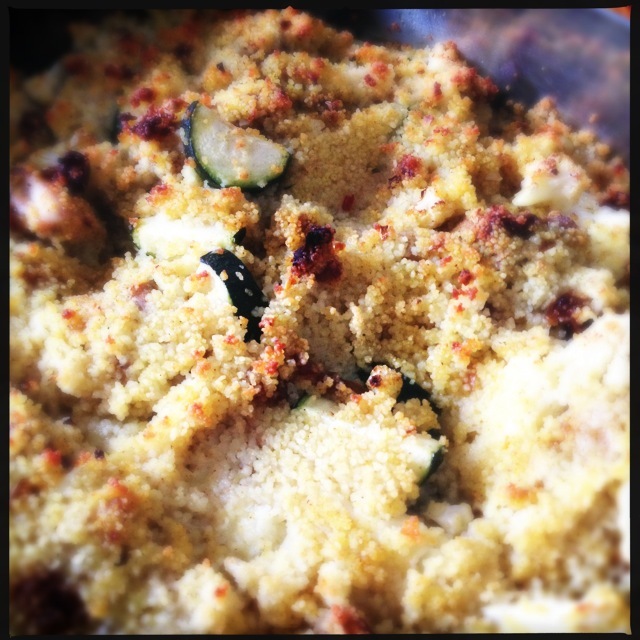 I have made it with wholemeal couscous too which was still very tasty. I made a little blunder tonight and added over a litre of stock instead of just 500ml. It was a bit wet compared to normal but still a great combination of flavours. The recipe calls for garlicky tomatoes to be served with it (as well as mint, coriander and pine nuts). All of which I feel are essential to turn a good dinner into an awesome one. 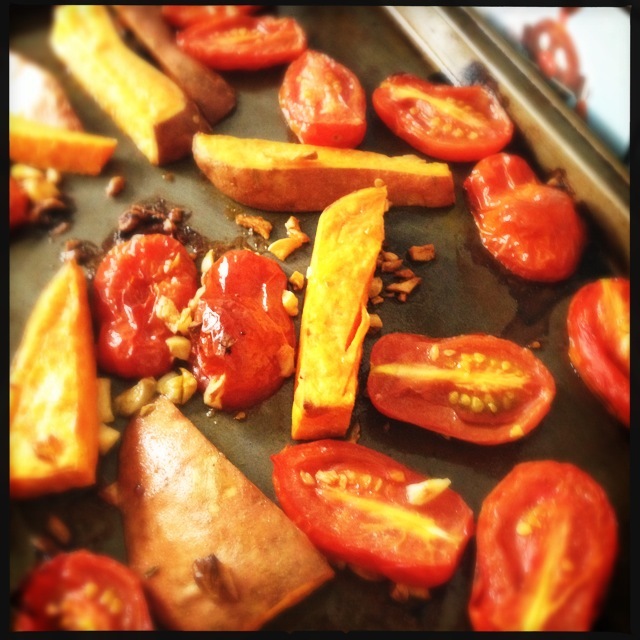 To make my life easier, I roasted some sweet potato “wedges” in the same tray for Possum’s dinner (they’re her favourite thing at the moment). Affordability : MODERATE. Uses a whole box of cous cous plus meat and herbs. We have mint in the garden but I had to buy coriander. I managed to score a tray of mini roma tomatoes on quick sale which made this a bit cheaper. I always have a jar of pine nuts so didn’t have to buy some just for tonight. The recipe makes plenty, you will have leftovers for certain. Time Factor : MODERATE. You will need to peel and chop 10 cloves of garlic all up. A little bit time consuming. A little hint is to squash the cloves with the side of your knife before attempting to peel. This will loosen the skin and make it much easier and faster. The two trays were in the oven for 35 minutes. Complexity : LOW. A bit of chopping and marinating but fairly straight forward. Deliciousness : EXCELLENT. Feel good, garlic laden, comfort food. Always a winner. Plus Possum loved it, though she did get a chilli flake on one of her pieces of chicken and wasn’t too happy about it. Mess : LOW. Two pan wonder. Plus a bowl to marinate the chicken. Tummy Filling Factor : EXCELLENT. The ratios were a bit off tonight with the stock mix up plus not buying enough chicken. But Lego Man and I were still both pretty full afterwards. We did enjoy a bowl of ice cream with my homemade strawberry jam/syrup on top though. Possum Friendly? YES. Salt kept low by using homemade stock plus no extra salt added. Spices didn’t seem to be as strong as usual (didn’t measure as I had a baby on my hip at the time) but flavour was lovely. Possum gobbled up her serve, but wasn’t super keen on the cauliflower. Would I make it again? Yes, most certainly.